Assignment Did President Kennedy have a clear vision of foreign policy objectives during his short term in office? Background John F. Kennedy was born in Brookline, Massachusetts on 29 May 1917. His father, Joseph Kennedy, was an energetic businessman who became a multimillionaire, head of the Securities and Exchange Commission and ambassador to Great Britain under President Franklin Roosevelt. In 1936, Kennedy entered Harvard University and graduated four years later. In 1941, shortly before World War II, Kennedy joined the US Navy. While on active duty in the Pacific in 1943, PT-109, the boat he commanded, was rammed by a Japanese destroyer off the Solomon Islands. Kennedy performed heroically in rescuing several of his crew, but he aggravated a severe back injury and contracted malaria. After recovering, Kennedy was discharged from the Navy in early 1945. In 1946, Kennedy ran successfully for a seat in the House of Representatives (reelected in 1948 and 1950). As a congressman, Kennedy backed social legislation that benefited his working-class constituents. Although he generally supported President Truman's foreign policies, he criticized the administration's stand against Communist China. In 1952, Kennedy ran and won a seat in the Senate, but he was an ineffectual senator. During parts of 1954 and 1955 he was seriously ill with a variety of ailments and was therefore unable to play an important role in government. While sick, Kennedy worked on a book of biographical studies of American political heroes. Published in 1956 as Profiles in Courage, it won a Pulitzer Prize in 1957. In 1960, Kennedy put together a well-financed, highly-organized presidential campaign. He especially performed well in a series of unprecedented television debates with his opponent Richard Nixon. While Nixon emphasized the experience that he had gained during his eight years in the Eisenhower administration and reminded voters of the "peace and prosperity" achieved under Republican leadership, Kennedy called for new, forward-looking leadership and more effective use of the country's human and economic resources. Kennedy promised tougher defense polices and progressive health, housing and civil rights programs. His New Frontier program, he said, would bring the nation out of its economic slump. Kennedy defeated Nixon by fewer than 115,000 popular votes, but he lacked a reliable majority in congress. In his inaugural address, Kennedy, the youngest President ever elected in the United States, set the tone of youthful energy and dedication that was to mark his administration. "The torch has been passed," he said, "to a new generation of Americans." Indeed, his Cabinet and his White House advisers made up the youngest group of top-level officials in the country's history. 1941-45, Kennedy served in the U.S. navy in the Pacific. 1952, Kennedy won election to the Senate. 1960, Kennedy won the presidential election. August 1961, Berlin Wall erected. 22 November 1963, Kennedy assassinated in Dallas. Lee Harvey Oswald, who had defected to the USSR in 1959 but returned in 1962, was arrested. 24 November 1963, Jack Ruby, a Dallas nightclub owner, shot Oswald. 14 March 1964, Ruby sentenced to death by a Dallas jury. The conviction was reversed 5 October 1966, but Ruby died 3 January 1967 before a second trial could be held. September 1964, Warren Commission report issued concluded that Oswald acted alone. Official sites include the official White House page on Kennedy and the John F. Kennedy Presidential Library, which includes archives, sounds, documents and images, such as the John F. Kennedy Photo History. Good reference sites are the Kennedy page on the Presidents of the United States sites, which is extremely useful; John F. Kennedy contains a detailed biography written by Frank Freidel, Jr. of Harvard University and suggestions for further reading; and John F. Kennedy from Character Above All in the PBS series with an essay by Richard Reeves that discusses some of the issues and events that molded Kennedy (Reeve makes some very interesting points about Kennedy's health.). Finally, there is yet another Kennedy site and a page of JFK Resources Online, as well as the Kennedy Assassination page. The State Department’s documentation on Kennedy’s foreign policy, which includes information on the Cuban Missile Crisis, Vietnam, Kennedy-Khrushchev Letters, Berlin, etc. The John F. Kennedy Assassination (the Mary Ferrell Foundation). Recommended Books Sympathetic studies include William Manchester, The Death of a President (1967); Arthur Schlesinger, Jr., A Thousand Days: John F. Kennedy in the White House (1965); Pierre SAligner, With Kennedy (1966); and Theodore Sorensen, Kennedy (1965) and The Kennedy Legacy (1969). 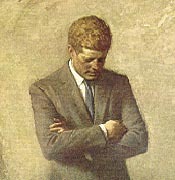 Among the many studies of the Kennedy White House, see: Irving Bernstein, Promises Kept: John F. Kennedy's New Frontier (1991); Paul Henggeler, In His Steps: Lyndon Johnson and the Kennedy Mystique (1991); Thomas Reeves, Question of Character: Image and Reality in the Life of John F. Kennedy (1991); Lewis Paper, John F. Kennedy: The Promise and the Performance (1980); Herbert Parmet, Jack: The Struggles of John F. Kennedy (1980); Theodore White, The Making of the President, 1960 (1961). On the assassination, see: Jim Moore, Conspiracy of One: The Definitive Book on the Kennedy Assassination (1990); Warren Commission, The Official Warren Commission Report on the Assassination of President John F. Kennedy (1964).